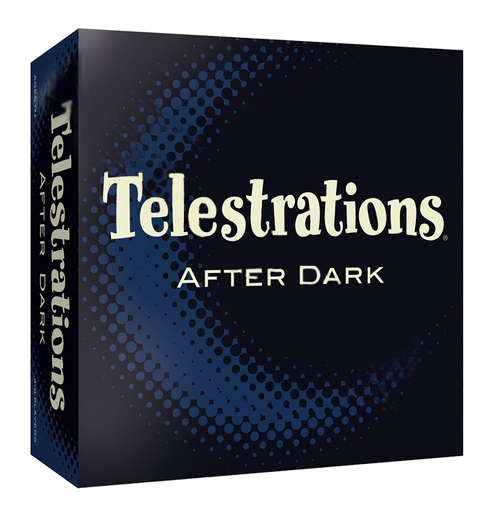 Telestrations After Dark is a game published by USAopoly. It is for 4-8 players. In this party style game, players will be drawing pictures and doing their best to guess what it is that the other players have drawn. They will gain points in several different ways, depending on the scoring path chosen. In the end, the player with the most points will be declared the winner. Before I begin this review let me state that this version of Telestrations is intended for adults only. Some of the words and concepts are a bit much for younger players. With that in mind, let’s begin. To begin, each player is given a sketch book and matching colored beverage coaster, as well as a clean up cloth. The cards are shuffled together and placed in the center of the play area. Players should write their name on the cover of their sketch book and place their beverage coaster in front of them for color reference. Players agree upon a scoring method as explained in the rule book. Each player then takes a card from the deck and play now begins. The game is played over 3 rounds. Each round, players will either choose a word from their card or everyone will agree on a specific number to use. Players will write it in their book. Depending on whether there is an even or odd number of players, each player will flip to page 1 “SKETCH IT!” and either get ready to draw or pass the book to the player on their left. Players will then flip back to view the word that they must now draw. Once everyone has finished with their sketches, players flip to page 2 and pass the open book to the player on their left. Players will now flip back to the previous drawing on page 1. They will now write their guess on page 2 “GUESS IT!”. The page is flipped to page 3 and the book is once again passed to the player on their left. This continues with players sketching, passing and guessing until each player gets their original book back. Each book should end with a guess, not a sketch. Players now take turns flipping through their book, sharing the sketches and guesses in their book. Players score points based on the agreed upon scoring method chosen before the game started. Once everyone has shared their book, players erase everything written in it over the last round. Players discard their card and take a new one. A new round then begins. A quick note on scoring. There are 2 different options for scoring. Players can either choose a friendly scoring method or a competitive one. For friendly scoring, players give a point for their favorite sketch in their book and 1 for their favorite guess. They earn a point if the last guess matches their word. For competitive scoring, guessers earn a point if they match the secret word. Sketchers earn a point if their sketch helps a guesser match the word. The player earns a point if the last guess matches their secret word, just like in friendly scoring. The game continues until the end of the 3rd round of scoring. Players then compare their score and the one with the most points is declared the winner. There’s not a whole lot to the pieces in this game. There are the spiral bound sketch books with dry erase markers and clean up cloths. These are pretty cool, especially the books. They’re very durable and well put together. Which is good since the books get passed around quite a bit. There are also colored coasters that match the spiral coil of the sketch books. I find that to be pretty cool. I especially like being able to have the coasters to keep track of your color. Finally there are the cards. These are pretty good quality and simply have text written on them. Nothing fancy but they get the job done and seem to be durable enough to handle shuffling and lots of handling. Overall the pieces are nice and fit really nicely inside the insert. Nothing really to complain about. Since this game is so simple, the rule book is also simple. It only consists of 4 pages. There are plenty of pictures and a walk through of the game. You really don’t need anything more than that. The scoring options are listed on the back, along with some suggestions on making the game a bit more twisted. There’s also a bit about how to take care of the markers and books to make them last longer. Pretty basic information for anyone that’s ever used dry erase markers and boards but it’s there none the less. Like with the components, nothing really here to complain about. I’m not really all that big on party games. I just don’t normally care to play them. However I don’t mind one every now and then if you have non gamers around that want to do something more than eat, talk and watch TV. That said, this game seems fun enough, even for people with no artistic talent. Of course the thing to remember is that this game is not for kids. Some of the words and concepts are a bit much. It’s really easy to have some obscene things come up that you’d rather not have to deal with. In other words, I do NOT recommend this game for younger players or family gamers. In the right atmosphere with the right people, this game might be ok. However for me, my choices usually aim more to the family play style. If my kids can’t play it then it probably won’t see very much table time. That’s not to say that this is necessarily a bad game, it just doesn’t work for me. I’m sure that we’d be a lot happier with something along the lines of the regular version of Telestrations. Chances are it would go over a lot better at my house. Certain words and phrases were not things that I’d want my kids hearing referenced or that I’d discuss in polite company. As it is, I can only recommend this one for players that are ok with more adult situations. Family gamers, leave this one alone. 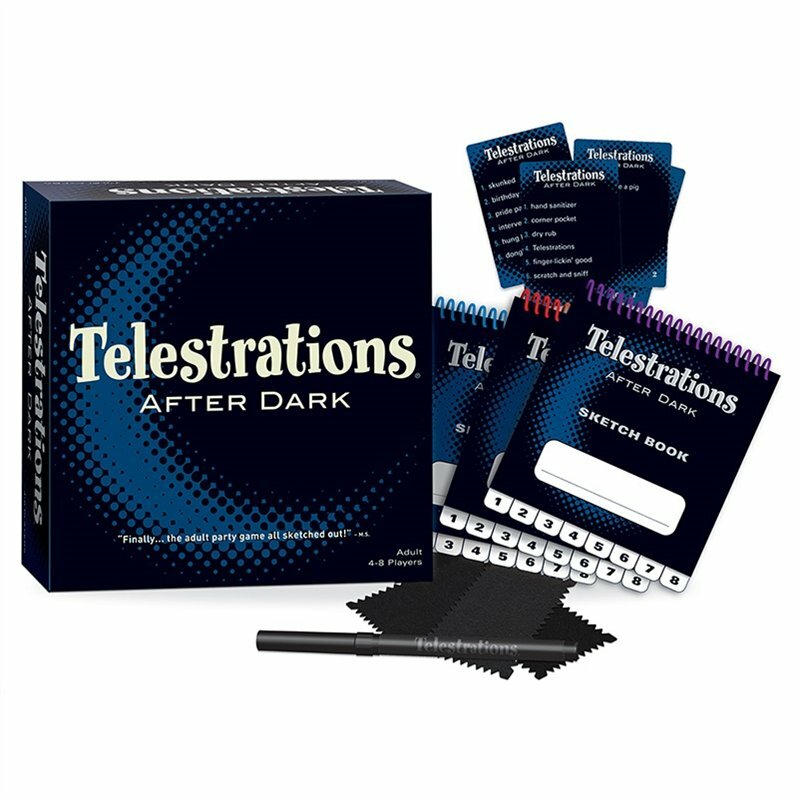 Telestrations After Dark is a party game of drawing and making guesses. It’s relatively short with most games lasting around 20-30 minutes. The components are pretty nice and what you’d expect from a party game. The cards are pretty durable and well designed. The game is for mature players and not one that I’d recommend for younger players. As I do a lot of family and children’s style games, this one just didn’t work for me. Some of the phrases and words were a bit too mature and not things that I’d discuss or reference in polite company. This is one that needs a certain audience and unfortunately, that’s not me. However if you don’t mind mature subject matter and goofy drawings, then you might like this one. This is just a game that I couldn’t make playable. I’m sure that the original Telestrations would be more in line with my group. For me, this is another huge pass and not one that I can recommend. This entry was posted in Reviews and tagged after, board, board games, card, card games, dark, games, telestrations, telestrations after dark, usaopoly. Bookmark the permalink.